"Thes are dance tunes, essentially simple, but Wör’s arrangements are finely textured, their performance exuberant. Wör make going back to the 1780’s an attractive notion." "WÖR, a massive hit with audiences at the Shetland Folk Festival 2016. Not only did they deliver a very powerful sound, they engaged really well with all ages in the audience who reacted with lots of smiles and appreciation. A fabulous edition to our 2016 lineup and hopefully this will be the first of many gigs in the UK, they absolutely deserve it." Back to the 1780’s! If it sounded good back then, why not today? That is, until now! With their finely textured arrangements WÖR injects new energy into 18th-century tunes from the Flanders region of Belgium. Their music shines an inventive spotlight, with a modern twist, on tunes from these manuscripts. 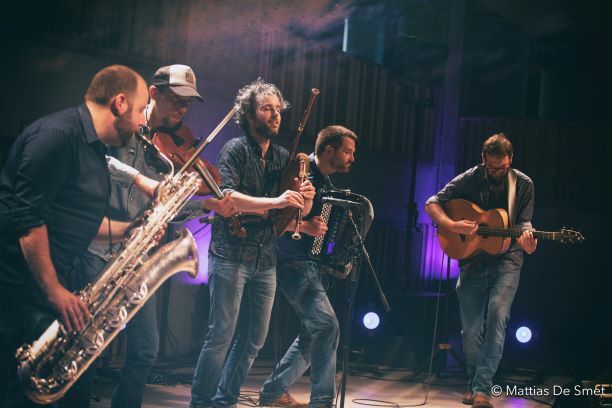 They released 2 albums (‘Back to the 1780’s’ (2015) and Sssht (2017) and toured in Europe, Australia, Canada & the US (including the National Folk Festival, Musikfestspiele Potsdam Sanssouci, Concertgebouw Brugge, Sunfest, Shetland folk festival..). In August 2018 they won the German awaurd ‘Preis der Deutschen Schallplattenkritik‘ with their last album ‘Sssht’.